1. Preheat oven to 325°. Lightly grease a 1 1/2 quart, shallow baking dish. 2. 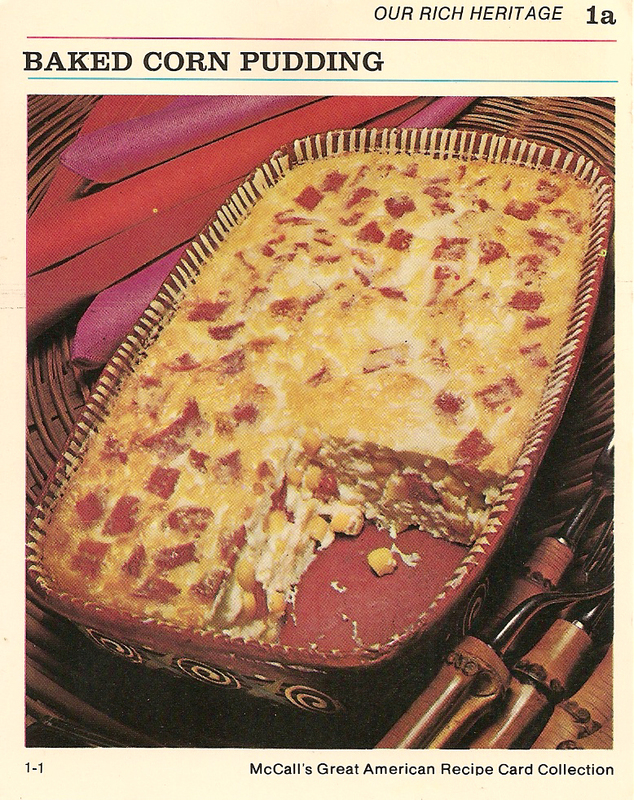 In large bowl, combine corn, eggs and onion; mix well. 3. Combine flour, salt, pepper, sugar, and nutmeg. Stir into corn mixture. 4. Add butter, cream, and pimientos; mix well. Pour into prepared dish. Set dish in pan. Pour hot water to 1-inch depth around dish. 5. Bake, uncovered, 1 hour, or until pudding is firm and knife inserted in center comes out clean. Serve hot. Cut into squares. So this looks disgusting (slightly better in person), but i made it a few weeks ago in my foray into “Americana” cooking and was surprised how good it was. The pimientos seemed superfluous, they didn’t add anything to the dish except color. Good as is, amazing topped with hot sauce.